You, Me and Movies: Review: "Despicable Me 3" charts into new territory and is better for it! Review: "Despicable Me 3" charts into new territory and is better for it! I think the "Despicable Me" movies are fun. They aren't great or mind-blowing, but fun. I have enjoyed the characters. I find Gru funny and he brought to absolute tremendous life by Steve Carell's voice. I like Gru's adoptive daughters. I like his new wife who is voiced by Kristen Wiig. I love all the dog-gone minions. 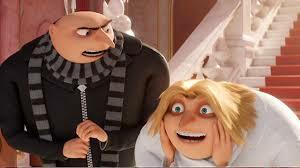 I like Gru's assistant, Dr. Nefario and how I can't hear a single aspect of Russell Brand's voice in him. Shocking I tell you. Its been a fun series, its been safe and ultimately familiar. But its been a fun series. I don't think the second film really did anything better than the first movie, and I don't think the series has lived up to its potential. "Despicable Me 3" is a representation of what I personally look for in sequels. Most sequels just remake the first film, they don't expand on the characters or presents new challenges to them. I find nine out of ten sequels frustrating because its just putting the characters into a similar situation as the first film, but just slightly different. In the first "Despicable Me," Gru learns not to be a villain and learned to love his daughters. In "Despicable Me 2," Gru learned to use his villain skills to be a hero and learned to love a woman. They are very similar movies. One thing that is, at the very least, refreshing about "Despicable Me 3" is that its not really about Gru learning something new. It just simply puts its characters into a new challenge and expands the mythology of its characters. That's what I hope for in every sequel I sit down to watch. The film opens with the introduction of Balthazar Bratt (voiced by Trey Parker of South Park), an old 1980's star who has turned into the next big supervillain. Gru and his wife Lucy Wilde, who are now employed by the Anti-Villain League. The capture of Balthazar Bratt goes less than well, and when the Anti-Villain League gets taken over by new management, Gru and Lucy are out of the job. The minions want to return to a life of crime, but Gru refuses, so the minions leave Gru. With no job and no more minions, Gru is abruptly visited by Fritz (Steve Coogan), who is the butler of Gru twin brother Dru. Gru never knew he had a twin brother and he and his family go to visit him. Dru doesn't just want a family reunion though, he wants something very specific from Gru. What is it and will Gru accept? And what is Bratt up to? There were several moments in this film where I thought I had the film all figured out. But "Despicable Me 3" surprisingly throws curve balls in nearly every corner. I liked, at the very least, being on the edge of my seat. I liked that each character had some sort of challenge to face. Gru meeting his twin brother and having a new revelation. Lucy adjusting to being a mom and trying to do right by Gru's daughters. Dr. Nefario is...well...occupied by something cold. The minions go on their own way, but they eventually miss Gru. There is something that each character faces, and I think parents who have been watching along with their children will find something new for the characters to face, and I hope you enjoy. This is not just the same thing over again, this feels fresh. Which is nice. The animation is, as to be expected, luminous. But I will admit that the animation has always been a little too cute for me. In fact, that is the biggest nitpick I have had for this entire series is that everything about these movies are cutesy. The humor, the visuals, the screenplay...its all very cutsey-poo and on-the-nose. I don't think it all lands every time. This is what separates the other animation studios from Pixar, they make movies for everyone. The other studios make animated movies for kids. I think the themes in this movie are universal, so that's a step in the right direction. But it what keeps this franchise in the fun zone and not something important. Something more that is very clear they are reaching for.